There's nothing worse than waking up in the middle of the night, glancing over at your iPhone to check the time, and seeing a bunch of notifications that demand your attention and distract you from getting back to sleep. 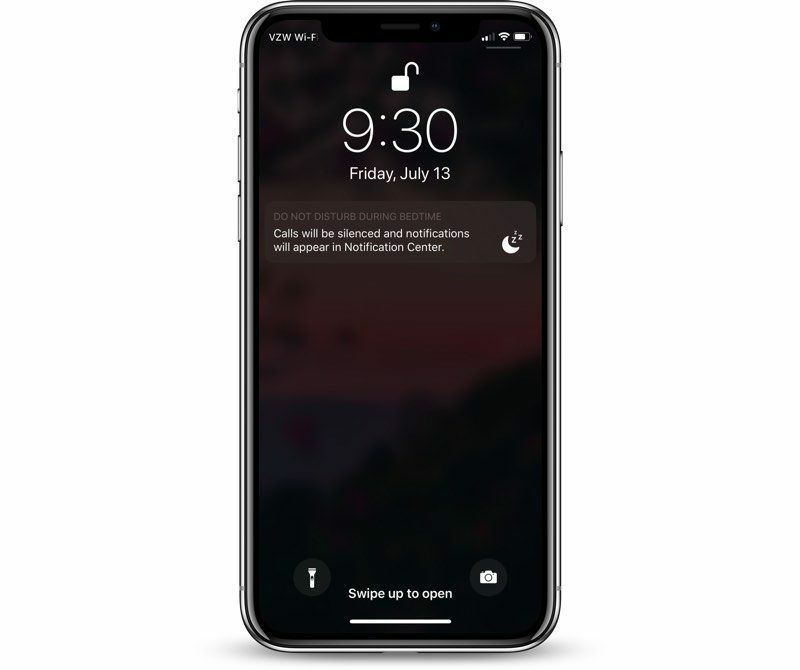 Apple is aiming to prevent this in iOS 12 with a new Do Not Disturb at bedtime feature that prevents notifications from being displayed on the iPhone's Lock Screen during your downtime, removing the temptation to start opening up apps in the middle of the night. Scroll to the "Do Not Disturb" section and tap on it. In the Do Not Disturb section, tap on "Scheduled" to toggle it on. Select your Do Not Disturb time period, which, for most people, should be from when you go to bed until when you typically wake up. Tap on Bedtime Mode to toggle it on. With Bedtime Mode enabled, when you activate the display on your device, the entire screen is dimmed and black, offering up only the time, the current device charge, and a notice that Bedtime Mode is turned on. In this mode, all incoming calls are silenced as are all incoming notification messages. Your notifications are still listed in the Notification Center, accessible by swiping down from the top of the display, but you won't see them on the Lock Screen. 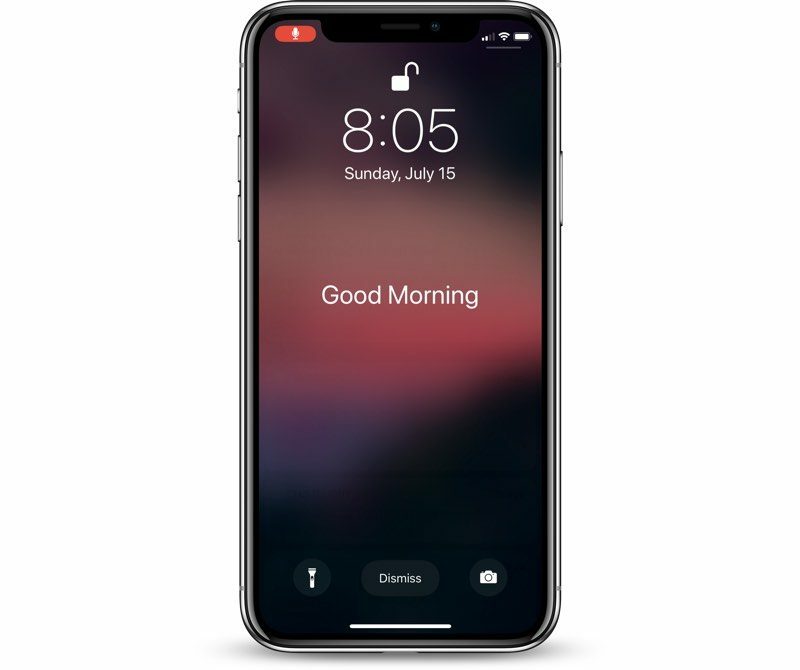 With Do Not Disturb turned on without Bedtime Mode, all of your incoming calls and notifications are still silenced, but the notification messages themselves will all be visible right on the Lock Screen. If you want family members to be able to contact you even with Do Not Disturb and Bedtime Mode turned on in case of emergency, there's a setting for that. Scroll down to the Phone section where it says "Allow Calls From." Select Everyone, No One, or "Favorites," which can be set up in the Contacts app. 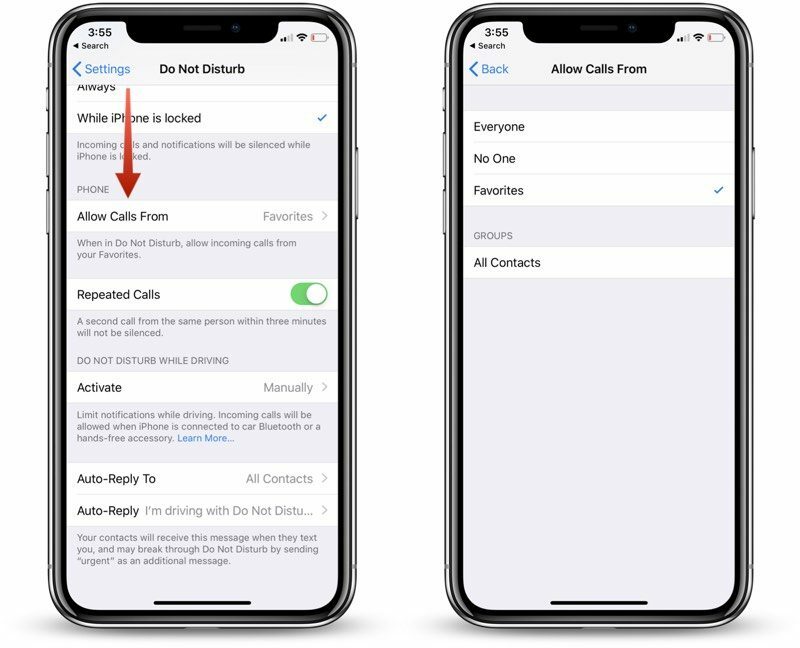 You can also toggle on "Repeated Calls" in the same section of the Settings app so a second call from the same person within three minutes won't be silenced. This is an ideal way to screen out unwanted calls while still allowing for potential emergencies as most people will try again if you're unreachable in a crisis. When it's time to wake up, and when Bedtime Mode is scheduled to go off, your iPhone or iPad will display a "Good morning!" message and it will let you tap to reveal all of the notifications that were silenced during the night. If Bedtime Mode isn't for you, you can turn it off in the Settings app where it was enabled. Tap on "Do Not Disturb." If you want to turn off your scheduled Do Not Disturb session entirely, toggle off "Scheduled." If you want to leave Do Not Disturb on but disable Bedtime Mode, tap the Bedtime Mode toggle to turn it off. Note: To quickly access Do Not Disturb settings, swipe to open up the Control Center and then 3D Touch or long press on the little moon icon. 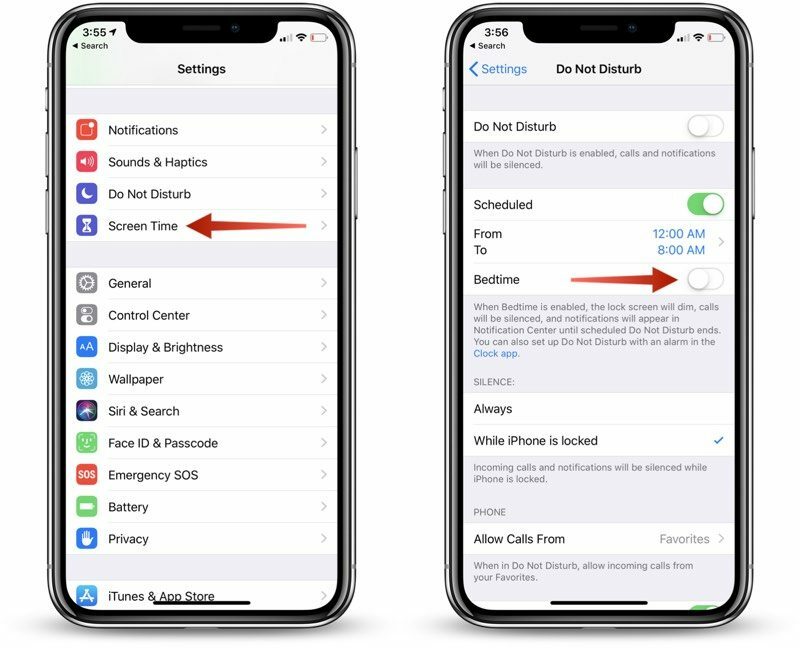 This will provide you with options to enable Do Not Disturb for an hour, a few hours, until the end of an event, or until you leave a specific location, and it also offers up a "Schedule" option at the bottom that opens straight into the Do Not Disturb toggles in the Settings app. Ok...I got it to work the way that I want it to. I opened the clock app to the Bedtime feature. Then tapped options in the upper left corner. Then turned on the "Do Not Disturb During Bedtime" option. I'm not sure if that's new, or not. This may be the most poorly implemented idea from apple in a while. Too many places to turn it off and on and to many options that are misleading. Why even have a bedtime toggle switch under the schedule if you still have to manually adjust the time to match the bedtime???? Make those options independent or don’t have the bedtime option on that screen at all. Can you use this without 'scheduled' being toggled, just by toggling 'bedtime' on when required? You know, I thought that. But. I have mine set to DND for bedtime until 530am. Reason is where I work, we open at 6. I’d like to not be bothered until I need to wake up, but, if something comes up I don’t want to be that person who didn’t answer multiple phone calls. But. Alarm is set for 7am. I don’t see why Apple even added Bedtime mode. Putting the iPhone face down on the night stand with DND turned on just works fine. The article is wrong MacRumors. There are two DND modes. The bedtime is the second one so going back to your guide, you don’t have to set DND for hour sleep time. You do that in the clock app. I wish bedtime mode would turn on and off according to the bedtime you have set. It would also be nice if when I wake up I dont have to enter my passcode. It seems like I have to enter my 4 digit code more when I wake up than any other times of day.